You can take the easy way to see the Himalayas by boarding a plane in Kathmandu for the short flight around Everest. Or you can summon up all your strength and sense of adventure, pull on your hiking boots, slip into your backpack and follow the donkey dung on one of the many trekking routes into the thin air of this remote region of Nepal. We chose the latter and spent 23 days on the Annapurna Circuit ascending with great effort to almost 5,500 metres or about 18,000 feet – and then descending, at a leisurely pace – through stunning landscapes of rice paddies and banana palms, stands of bamboo, pine forests that reminded us of Canada, subarctic terrain above the tree line and countless apple orchards, corn fields and gardens full of cabbages and pumpkins. In all we trekked for 300 kilometres. And, of course, there are the mountains, capped with dazzling white snow, made luminous by the bright sun, and bearing such names as Pisang, Chulu, Annapurna, Tilicho and Gangapurna. We, in this case, are three moderately mad retired guys, Bob Johnston, 66, Ned Ellis, 54, and myself, 64, who are not above accepting a certain amount of deference from the many young people, mainly from Australia, Israel and the Netherlands, whom we bumped into along the way. We arrive at the beginning of Dasain, the biggest of the country’s festivals, and there are many goats are in Kathmandu awaiting slaughter for the holiday feasts. The method is simple: A man slits the throat over a gutter in the street and then the carcass is skinned in a pot of warm water. It is not a good day to be a goat, my friend Ned Ellis remarks. We spend a day in Kathmandu with a local guide leading us on a whirlwind tour to Baudha Temple, draped in fluttering Buddhist prayer flags and a major centre for Tibetans. Then we take a long walk to Pashupatinath Hindu Temple where a large number of sadhus (holy men) while away the day having their pictures taken with tourists (for a fee, of course) while monkeys frolic around the buildings. The Hindu site on the banks of the Bagmati River has several funeral pyres, including one reserved exclusively for the royal family. As the embers of a cremation die down, they are swept into the river, where two men sift through the ashes for such treasures as gold fillings. The next day we head out of the city in an SUV with our trekking guide, Nabin. The going is slow. Many people are travelling home to their villages for the festival, and the two-lane road is jammed with overloaded cars, trucks and buses stacked with suitcases and people on top. Nine hours later we arrive in Besisahar, the starting point of our trek. It’s about 300 kilometres west of Mount Everest. We check into a small hotel and dig into dal baht, the national dish of Nepal, for supper. Consisting of lentil soup with rice and curried vegetables, it is the fuel that powers porters, guides and trekkers up and down the trails of the Himalayas. We’ll have it many more times, sometimes twice a day, although lunch is more often noodle soup and spring rolls, with everything made from scratch. Breakfast is often two fried eggs (“cooked both sides”) with chapatis (grilled flat bread) or hot oatmeal. The latter provides a good base to get us going, walking sticks in hand. We push up the trails of the steep valley of the roaring Marsyangdi River, and at the end of the day we tally our progress over a beer, a Tuborg (imported from Denmark) or an Everest (brewed in Nepal). 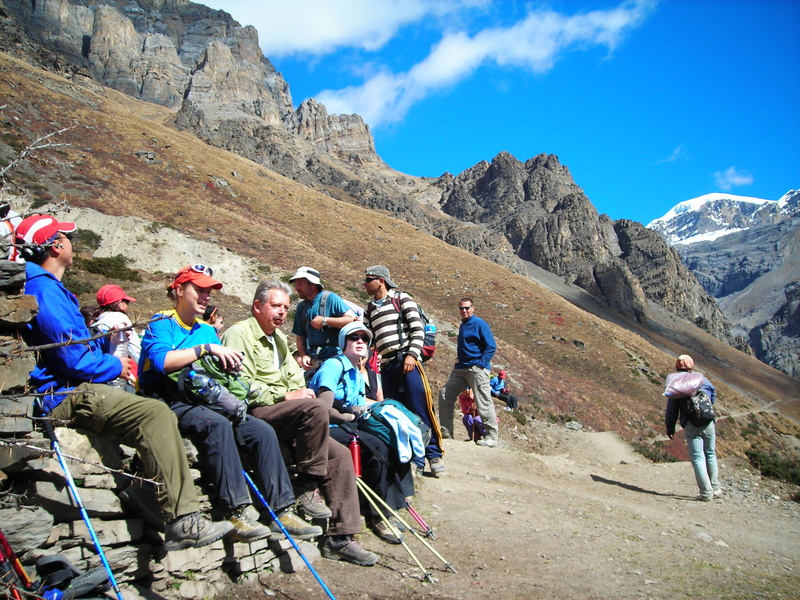 Trekkers pause heading to Thorung Phedi. The map says we are 300 metres higher, sometimes even 500 metres, than our starting point in the morning, but we know the ascent has been two and often three times as much because the path slithers up and down the slopes of the valley. It has been carved over the centuries – first by bare feet and then by porters in flip-flops carrying loads in baskets weighing up to 70 or 80 kilograms. Recently, younger porters have upgraded their footwear to running shoes and even hiking boots. At Jagat, we meet several neatly dressed young men sitting at a table with a red flag bearing a hammer and sickle behind them. There is no doubt who they are. They are Maoists and they want money. We part with 2,000 rupees each (about $25), and there is no argument from us because we have heard that they turn back trekkers who refuse to pay. A few days later in Braga, a small group serenades me with a refrain of Happy Birthday (it is my 64th), and the next day we hop over to Manang, where trekkers acclimatize to the altitude by taking day trips in the area. We decide to visit the 100-rupee lama, who is 90 years old and lives with his blind wife, age 89, in a small cave high above the village. It has been their home for 55 years. It takes us an hour and a half of arduous climbing to reach the lama, who is tended by his granddaughter, also a Buddhist monk, and another woman. Each of us gives the lama 100 rupees and a Mars bar for his wife. He wishes us a safe journey over the Thorung La pass, the highest pass in the world. While we appreciate the good blessing of the lama, we decide to hire a porter for three days to take our backpacks up and over the pass. Two days later we reach Thorung Phedi, our final stop before heading up to the pass. The only hotel is packed, and the restaurant is buzzing with electricity as the trekkers gather their strength for the final assault. We play cards with our Dutch friends Fleur and Erik to while away the afternoon and evening. Other trekkers join in our games from time to time. After a mostly sleepless night of gasping for breath in the oxygen-thin air of 4,420 metres (14,500 feet), we arise at 4 a.m. for breakfast before starting the climb. It’s pitch black and we turn on our headlamps to light the zig-zag path that takes us up the steep slope. With us are two young men from Kathmandu, the only two Nepali trekkers we met on the trip. With Bob Johnston in the lead, we take 100 steps and pause to catch our breath. Then we take another 100 steps and pause to recuperate. It goes like that for the first hour, until we get over the steepest part of the day’s journey – a climb of 500 metres. In the next three hours, we ascend another 500 metres and as we come over a ridge, we see Thorung La, 5,416 metres (17,769 feet) above sea level. That compares with the summit of Mount Kilimanjaro, which is 5,895 metres (19,340 feet). There are a few dozen people milling about shaking hands with each other and taking pictures. A young Israeli approaches us with a bottle of Irish whiskey and offers each of us a slug. “I want to be able to climb this route when I’m your age,” he tells us. One of the Nepali trekkers points to Bob Johnston and says, “You, sir, are a leader.” He’s referring to the technique of resting after every 100 paces to allow us to catch our breath and then push on. 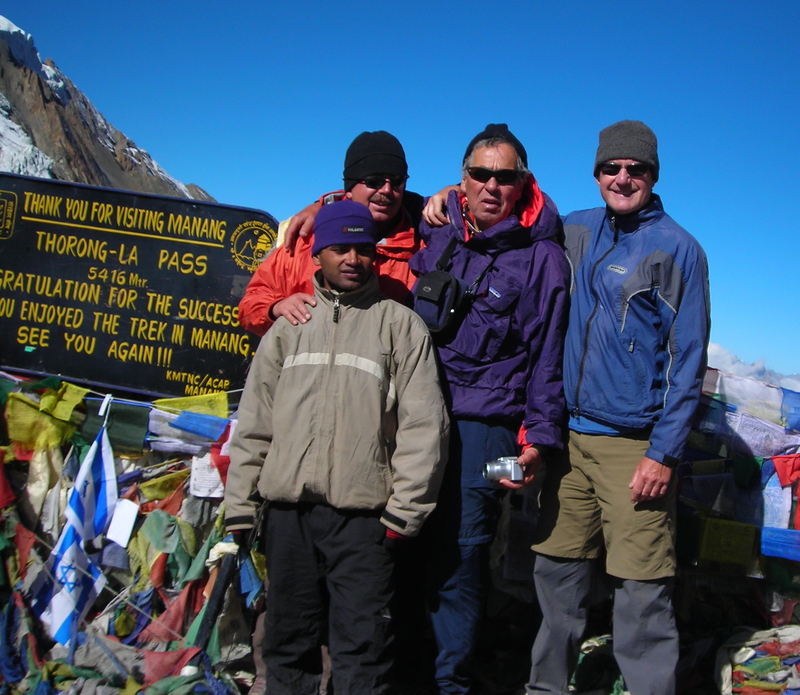 At Thorung La: Ned Ellis, Bob Johnston and Dave Yates with guide Nabin. We leave the celebrations behind and head for Muktinath. After another eight days of hiking along the Kali Gandaki River, through the town of Jomsom with its landing strip and military base for mountain warfare, Marpha, where we dine on superb tomato soup and rich apple pie, and Tatopani, where we bliss out in the excellent hot springs, we end up in the resort city of Pokhara for a few days of rest and recreation. We spend all of October in Nepal and find it to be a perfect time to visit. Apparently, somebody from the Canadian High Commission in New Delhi, India, popped into Nepal at about the same time and found the country to have calmed down considerably since the political fireworks earlier in the year. On our return to Canada in early November, we find that the Foreign Affairs Department has once again declared Nepal to be safe and a worthy place for the adventurous. Traveling in Nepal is like going back to the 1960s when you could do Europe on $10 a day. Hotels in Kathmandu and Pokhara will set you back up to $30 a night or more, but once on the trails, the small establishments – some have as few as five rooms – will cost $2 or $3 a night for single and double rooms. The rooms are basic with wooden beds and foam mattresses. Hotels provide quilts, but we took our own sleeping bags for the higher altitudes. Food is basic, fresh and local. Expect eggs and oatmeal for breakfast. Some kitchens do a very creditable job with pizza and pasta along with the traditional dal baht. We also ate salads of shredded cabbage and tomatoes. Altitude: The Himalayan Rescue Association has a clinic in Manang, and a doctor lectures every afternoon on the dangers of acute mountain sickness (AMS). It is a worthwhile way to spend an hour. Reading: Our guide was Trekking in the Annapurna Region by Bryn Thomas (Trailblazer Publications). It contains comprehensive information and maps on the Annapurna Region and other treks in Nepal. Many other trekkers carried it. Websites: There is plenty of lively conversation on Lonely Planet’s message board (thorntree.lonely planet.com). Go to Asia-Indian subcontinent-Nepal, where there is a lot of advice. Much of the best comes from stilltrekkin’, a 72-year-old Calgary woman by the name of Elsie James, who completed the Annapurna circuit for the fifth time on two rebuilt knees. A second one is yetizone.com, which also boasts a colourful thread, maps and photos of treks in Nepal. An amazing recount of your journey across the Annapurna. Got me all up in a fluster now as my feet are itching to get on the road once again. Another amazing journey David, we spent 10 days in India, Golden Triangle, but long to go back, its so fascinating.